Few sights rival the splendor of an illuminated Empire State Building on a clear New York night. It may not be New York City’s tallest building, but it’s possibly its most celebrated. Here’s a quick look back at the Empire State Building’s lifespan of world records, oddball tourist attractions, and surprising affinity for strawberry jam. 1. THE BUILDING AND ITS PLOT HAVE HAD MORE THAN A DOZEN DIFFERENT OWNERS. When the plot of land surrounding what we now know as 350 Fifth Avenue changed hands from the City of New York to private citizen and farmer John Thompson in 1799, its intended use was, aptly, of the agricultural variety. Thompson held onto the territory for 26 years before selling to Charles Lawton. Two years later, Lawton reaped a healthy profit when the famed Astor family became interested in the site as an investment property. William Backhouse Astor Sr. later converted the land for development of several mansions and, ultimately, the Waldorf-Astoria Hotel. In 1928, the owners of the hotel decided to move, and the land found a new owner in the Bethlehem Engineering Corporation, which wanted to tear the hotel down and build a 25 story office building. They defaulted and sold the land to the bank, where it got picked up by former GM executive John J. Raskob. In 1930, Raskob’s Empire State, Inc., and the architectural firm Shreve, Lamb & Harmon began work on the skyscraper. From there, things get muddy: After Raskob’s death, a succession of investors, developers, and companies bought and sold it, and in 2013, the Empire State Realty Trust Inc. went public with a $929.5 million initial public offering. 2. ITS ICONIC SPIRE WAS DESIGNED AS A PORT FOR DIRIGIBLES. Following completion of the design for what was intended to be a 1050-foot-tall skyscraper, construction chairman and former New York State Governor Al Smith decided to tack on an additional 200 feet for good measure. The extra height was not allocated for supplementary stories but for a spire that would serve as a mooring mast for the docking of airships. Though Smith asserted that his was a decision of practicality—citing the fact that the closest port for dirigibles was in Ocean County, N.J.—many suspected it was Smith’s desire to strip the 1046-foot-tall Chrysler Building of its world record that inspired the change. 3. THE BUTTON THAT “OPENED” THE EMPIRE STATE BUILDING WAS LOCATED IN WASHINGTON, D.C.
4. A BOMBER PLANE ACCIDENTALLY CRASHED INTO THE BUILDING. It was a foggy Saturday morning in July 1945, and a North American B-25 Mitchell bomber aircraft was en route from Massachusetts to the New York metropolitan area. Accounts differ wildly about what exactly happened, but the plane was probably bound for Newark Airport when it was redirected to the future LaGuardia Airport due to dwindling air visibility—and then LaGuardia also denied the landing. The plane was captained by William Franklin Smith Jr., a former military pilot who had seen active duty in Germany in 1944. (He was alleged to have said of the weather that morning, “An English day if I ever saw one.”) Confident in his skills no matter the conditions, Smith rejected suggestions to turn his aircraft away from the city, ultimately falling victim to the thick haze and colliding with the top of the skyscraper in a fiery crash that left 14 dead. 5. A WOMAN JUMPED FROM THE EMPIRE STATE BUILDING’S 86TH STORY AND LIVED. Another episode of poor weather actually saved the building from tragedy 34 years later. In early December 1979, Bronx resident Elvita Adams visited the Empire State Building with the intention of committing suicide. The 29-year-old woman leapt from the 86th story observatory, approximately 1050 feet from street level. Adams only fell about a dozen of those feet, however, when a strong gust of wind forced her onto a 2.5 foot ledge on the 85th floor, where a security guard pulled her in through a window. The freak occurrence saved Adams’s life, leaving her with only a fractured hip. 6. THE BUILDING’S FIRST CLEANING TOOK SIX MONTHS. 7. A LARGE AMOUNT OF PRESERVES ONCE COVERED MUCH OF THE BUILDING’S FAÇADE. 8. THE EMPIRE STATE BUILDING HAS ITS OWN ZIP CODE. The tower stands within the geographical boundaries of Manhattan’s 10001 ZIP code, which covers land east of 5th Avenue and between 25th and 35th Streets. Since 1980, however, it has distinguished itself with a unique code of 10118. 9. THE SECOND FLOOR OF THE BUILDING INCLUDES A STAR-STUDDED MOTION SIMULATOR. As if a spectacular bird’s eye view of New York City weren't enough of a tourism draw, the Empire State Building introduced a motion simulator in 1994. Located on the building’s second story, the simulator featured a video recording of actor James Doohan—known best as Lieutenant Commander Montgomery “Scotty” Scott from the Star Trek franchise—leading participants on an aerial tour of New York. Eight years later, Scotty was canned in favor of a different celebrity guide: Kevin Bacon. 10. THE BUILDING’S MOST FAMOUS VISITOR WAS HONORED FOLLOWING HER DEATH. The Empire State Building boasts a lengthy screen résumé, appearing as a visual signifier of the Big Apple in hundreds of feature films. The most iconic cinematic representation of the building dates back to the 1933 version of King Kong, which famously starred early Hollywood icon Fay Wray as Ann Darrow, the woman whom the titular ape brings to the top of the skyscraper. Two days after Wray’s death in 2004, the Empire State Building undertook a rare dimming of its lights for 15 minutes to honor the actress. 11. THERE WAS AN ENTIRE FLOOR IN THE BUILDING DEDICATED TO NAPPING. Even one of the busiest office buildings in North America can appreciate the value of some good rest and relaxation. Between 2004 and 2008, the 24th story of the Empire State Building hosted a league of “nap pods,” spherical electronic beds that foster easy snoozing via the emission of comfortable cushioning and ambient audio recordings. 12. THE RENOVATED LOBBY TOOK LONGER TO CONSTRUCT THAN THE REST OF THE BUILDING COMBINED. The Empire State Building’s April 1931 completion marked a rather swift turnaround for a building of its stature, with the entire structure going up in less than 14 months. (What’s more, the steel work wrapped 12 days ahead of schedule.) The 1931 construction team’s efficiency is especially impressive when compared to the 2008 renovation in which the Empire State Building’s lobby endured a complete makeover back to the original aesthetic that predated interim renovations. The foyer reboot, which finally opened to the public in September 2009, took more than four months longer to complete than the entirety of the skyscraper had eight decades prior. Though celebrated as a pinnacle achievement in 20th century architecture, the Empire State Building was not a complete original. In fact, Shreve, Lamb & Harmon architect William Frederick Lamb revived his old designs for the Reynolds Building, an industrial skyscraper erected in 1929 in Winston-Salem, N.C., as a blueprint for his new project. What’s more, the Empire State Building takes pride in sharing a proverbial bloodline with the Reynolds. Every June, the New York native ships a Father’s Day card down to the Tar Heel State as a payment of gratitude for its inherited attributes. 14. THERE IS A SECRET 103RD FLOOR. Popular understanding indicates that the Empire State Building’s 102nd floor observatory is the highest accessible point of the skyscraper. That’s not quite true, although you’ll need to curry favor with the building’s management if you want a special invite to the private observatory one story higher. 15. THE BUILDING HAS CLAIMED A NUMBER OF HEIGHT-RELATED SUPERLATIVES. 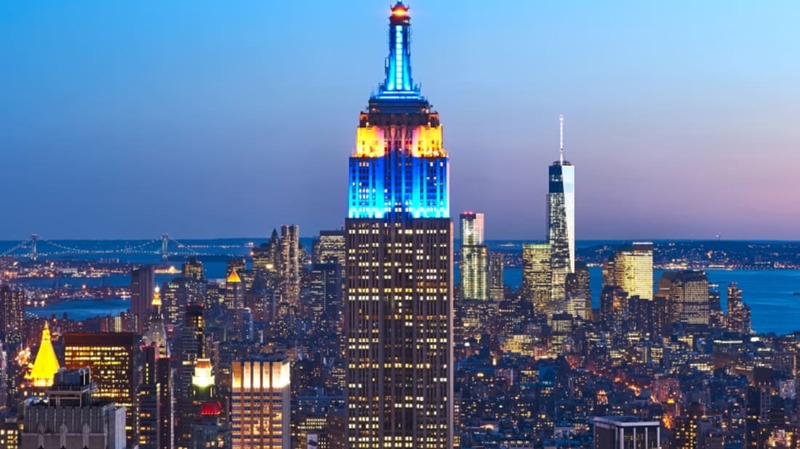 At various points throughout its lifespan so far, the Empire State Building has showered in the pride of being the “tallest” in a number of categories. As of its completion in 1931, it became the first ever building to exceed 100 stories. It went on to hold the title of world’s tallest manmade structure until 1954 (when it was bested by the Griffin Television Tower Oklahoma), world’s tallest freestanding manmade structure until 1967 (topped by the Ostankino Tower in Moscow, Russia), and world’s tallest building until 1970 (trumped by the North Tower of the World Trade Center, just 3.5 miles from the Empire). After the fall of the Twin Towers in 2001, the Empire State Building once again qualified as the tallest building in New York until 2012 (trounced, fittingly, by One World Trade Center). In 2011, the Empire State Building became as the tallest Leadership in Energy & Environmental Design (LEED)-certified building in the United States. As of 2015, the building is America’s fifth-tallest skyscraper, and the 30th-tallest in the world.